One thing I learned while studying at Vision Baptist Missions is that a missionary should focus on the process. We all want results, but even a casual reading of Scripture teaches us that ultimately the results are in God’s hands (I Corinthians 3:5-9). Though I can not produce the results myself, I can work through the process.Many become discouraged when there are no results because that is where their whole focus is. Rather than focusing on the product, focus on the process. What is the process? It is all the things I have mentioned already in this series (If you missed them you can start here Part 1). It is preaching the gospel, discipling, and training men. I can’t make people get saved but I can preach the gospel. I can’t make someone grow spiritually, but I can devote my time to teaching them one on one in discipleship. I can’t call young men to preach, but I can challenge them to give their lives in service to Christ, I can help them get materials that will help them to grow. I can show them how to teach a Sunday School class, how to love their wives, how to manage their finances, how to study their Bibles. Still, we all want results. We want them, and we want them brought to us via express mail. Different missions organizations have tried many things down through the years, many would like to create a short-cut in training men or establishing churches, but there are none. I am not saying don’t use a new social media to help get the gospel out or don’t have technologically advanced equipment in your ministries. What I am saying is the product of ministry is organic, and it is people-focused. People do not grow overnight, over a week, a month, or even a year. It is a process, so focus on the process, quit trying to reinvent the wheel and just get to work. I think the process is pretty straight-forward, and you can find a summary of it in Acts 14. 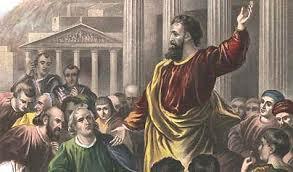 In Acts 14, Paul and Barnabas are continuing their first missions trip that they started in Acts 13. We see three things happening in this chapter that would sum up missions. This is the process, and it is the one our Founder and Savior put in place. It is a process that has taken Christianity from 120 meeting in an upper room to over 2 billion professing believers world-wide. Guess what? The process works. If you follow the process, the product or results will be there. I will address that in the next post. Great article. God is going to greatly use you!